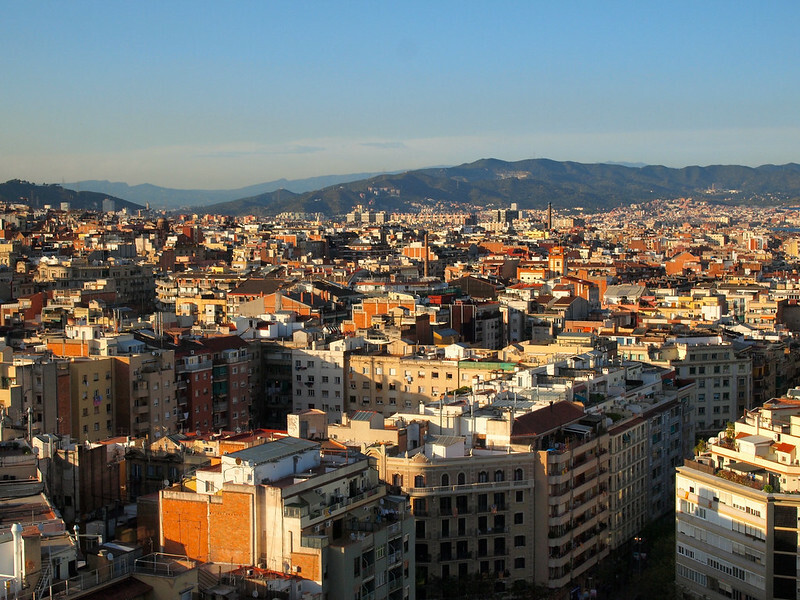 For years, I have felt ambivalent about visiting Barcelona. Fellow travel bloggers didn't seem that into it. Friends told me they weren't all that impressed. And then there was also the constant “you'll get robbed” warning that came up ANY time I heard or read anything about the city. Needless to say, I was in no rush to visit Barcelona. But then earlier this year the cards fell into place and I found myself with nearly two weeks of free time to spend in Spain. I honestly contemplated skipping Barcelona altogether and splitting my time between Seville, Granada, and Cordoba in the south instead. But the draw of Gaudi architecture and cheaper flights between Bucharest (where I'd be flying from) and Barcelona than anywhere else swayed me. I decided to spend a couple days in Barcelona after all. And I'm SO FREAKING GLAD I did. Because, as it turns out, everybody was wrong about Barcelona. Yes, Barcelona is a large city. Yes, there are some very touristy parts. And yes, like in any large city, tourists are often targets for pickpockets and scam artists. But, honestly? 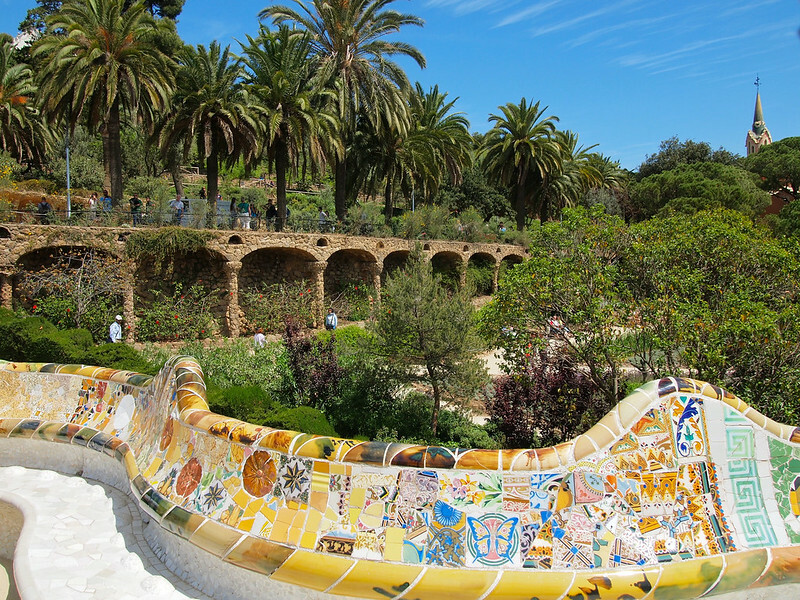 I didn't once feel unsafe in Barcelona — and the touristy parts didn't really turn me off at all. In fact, I LOVED Barcelona. Though, as I found out as soon as I started professing my love for Barcelona on social media, apparently I'm not alone. Clearly I was just talking/listening to the wrong “everybody”s before. After spending a total of 4 days in Barcelona, I brainstormed some theories about what contributed to me liking Barcelona so much. I went to Barcelona in late April/early May — before the tourists crowds and summer heat really set in. The weather was warm but not too hot like it can be mid-summer. And there WERE some lines at the major tourist attractions, but once inside things didn't feel too crowded. I think the time of year definitely can make a difference when it comes to visiting Barcelona and enjoying it. I couldn't go to Barcelona and NOT see the Sagrada Familia or Barri Gotic or Park Guell. The “top sites” in Barcelona really are recommended for a reason — they're all pretty awesome (especially the Gaudi architecture). But if you JUST focus on Gaudi houses and La Rambla, I guarantee that you'll get overloaded on tourist crowds. Barcelona isn't a place where you're ever going to get completely away from people, but there definitely are places you can go that are less touristy. Instead of eating along touristy (and expensive) Passeig de Gracia, head one parallel street over to Rambla de Catalunya. It's actually the upper part of La Rambla and has the same wide pedestrian section filled with tapas places in the middle, but it's way less crowded and the prices are much more reasonable. 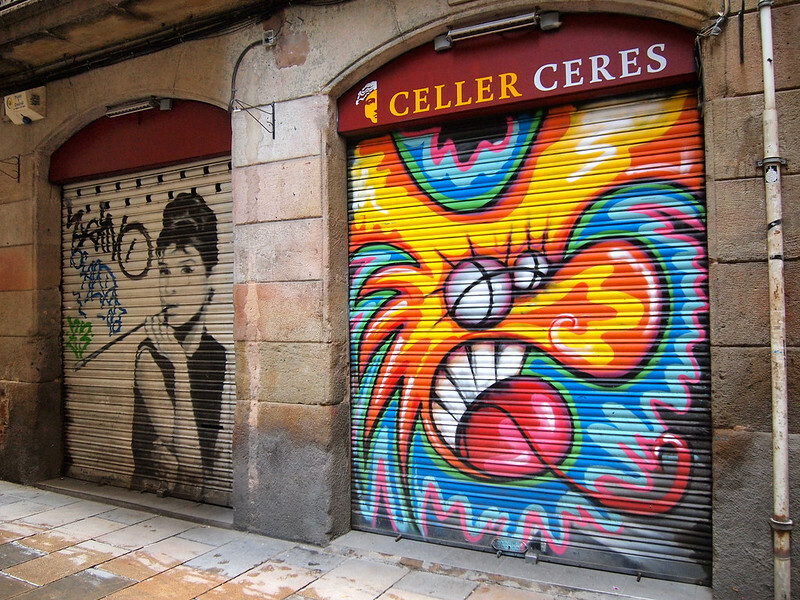 After you've had your fill of jam-packed Barri Gotic, head to the nearby El Born neighborhood. 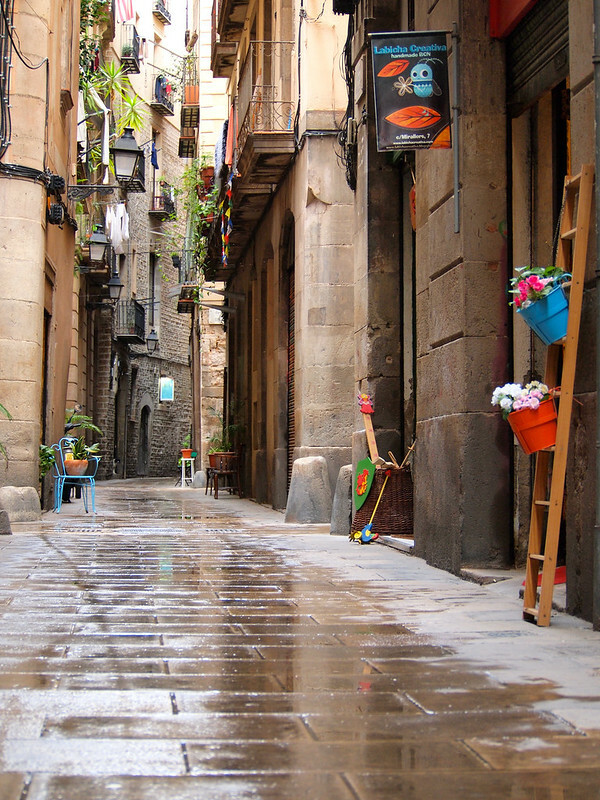 It has the same narrow streets and Barcelona character, but you'll find few tourists wandering around. 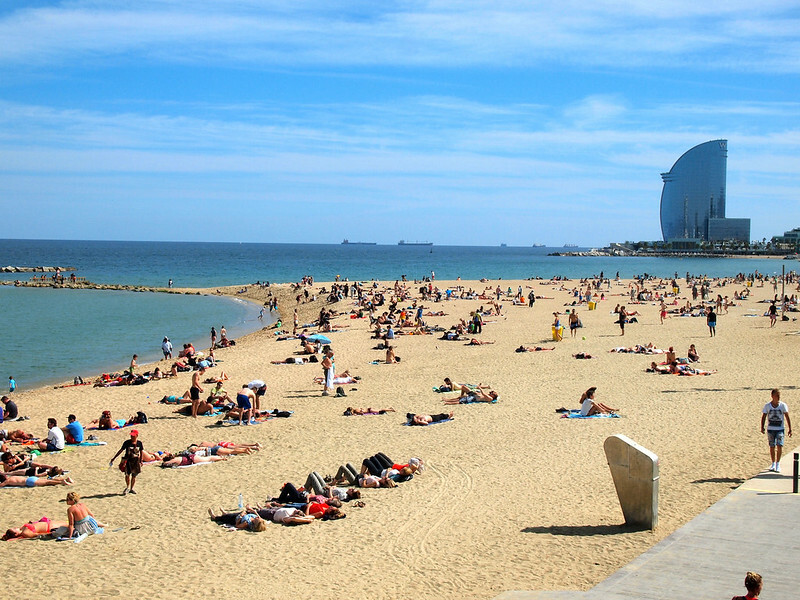 Take a walk to the beach via the Barceloneta neighborhood. This beachy part of town feels completely different than the center of the city! On my first day in Barcelona, I bought an Hola BCN! card from a metro station, which covers all public transport in Barcelona (metro, bus, tram, regional train, you name it). I got a 2-day card that cost 14 Euro. Considering a single journey is 2.15 Euro, simply taking 7 metro rides over 2 days saved me money (and I definitely took more than that). It was handy to have, and meant I never had to take my wallet out in a metro station. 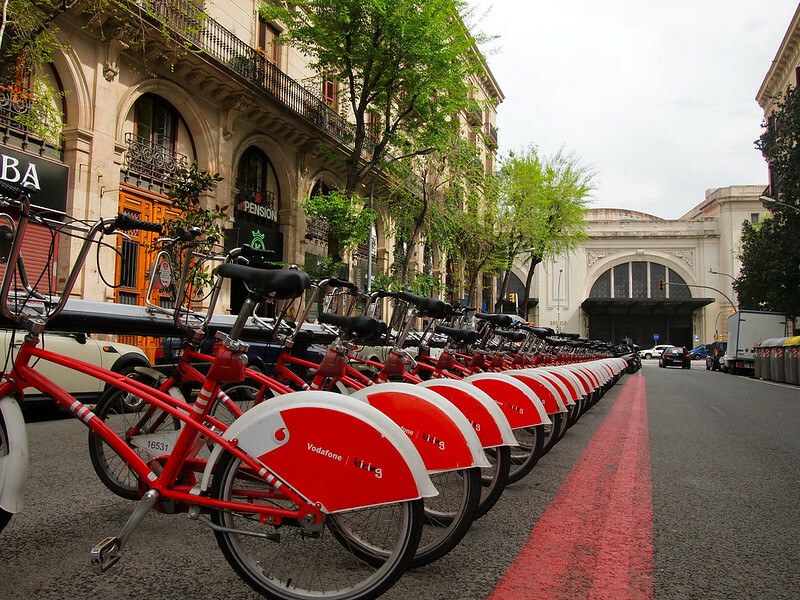 You can get these for 2, 3, 4, or 5 days — I would definitely recommend it if you plan on using Barcelona's public transportation a lot! I'm definitely of the belief that good accommodation in a good neighborhood can make or break an experience in a new city. I was lucky enough to have some great accommodations in a nice Barcelona neighborhood. 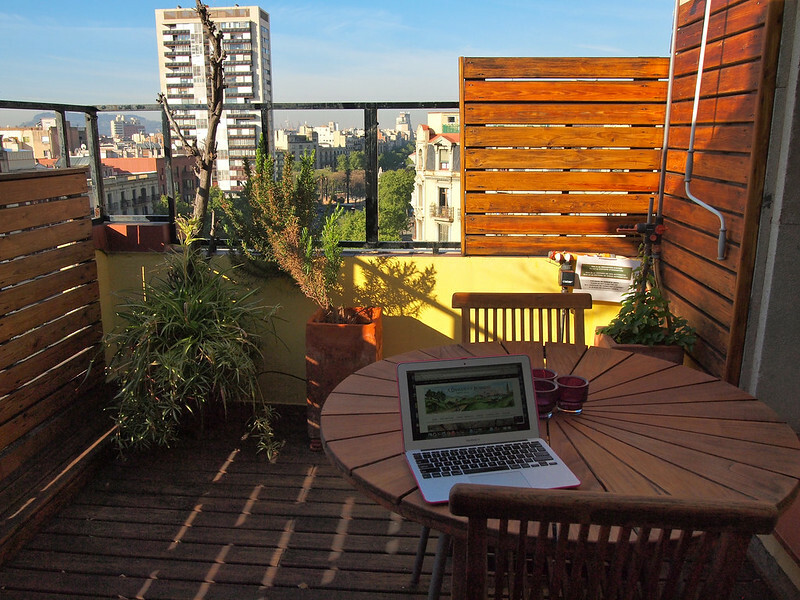 I stayed in a GowithOh apartment in the Eixample Dret neighborhood — close enough to everything, but away from all the crowds. 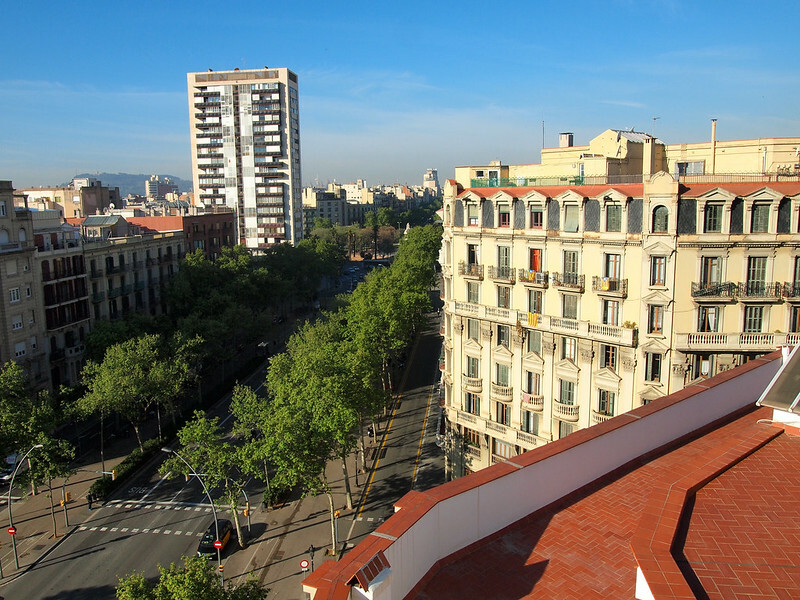 The apartment had a great terrace with a view out over Gran Via de les Corts Catalanes and was within a 5-minute walk from a metro stop and quite a few restaurants/cafes. I always like renting apartments when I travel partly because they usually come with more amenities — and because they just make you feel more like a local! Even though I visited before the start of high season in Barcelona, I still discovered that most of the popular sites (like Sagrada Familia and basically all the other Gaudi sites) had long lines during the day. Thankfully, I had been warned about this and was told that it's easy to book a timed ticket online. 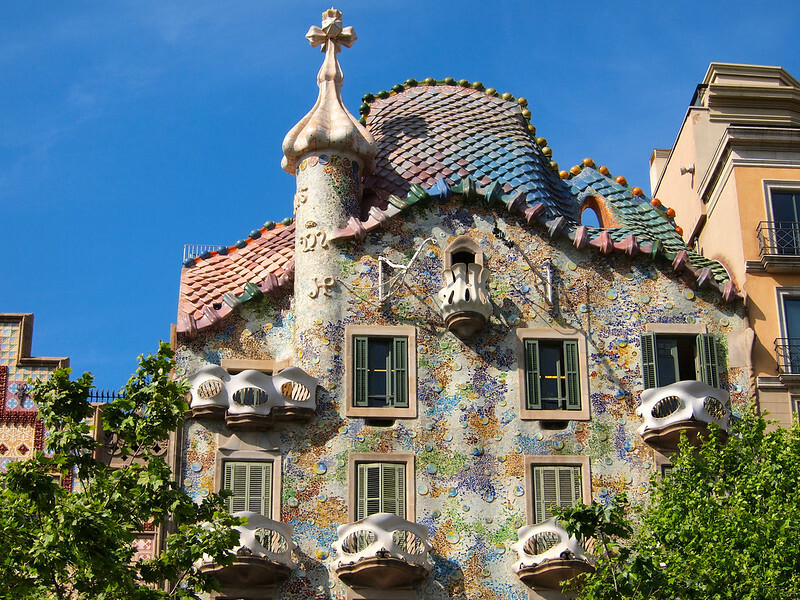 And it IS in fact very easy — you can book tickets for Sagrada Familia, Casa Batllo, and even Park Guell online. You pick a time, print your ticket (or just pull it up on your smartphone), and then show up at the entrance at your appointed time. This greatly reduces time wasted standing in line to buy a ticket! 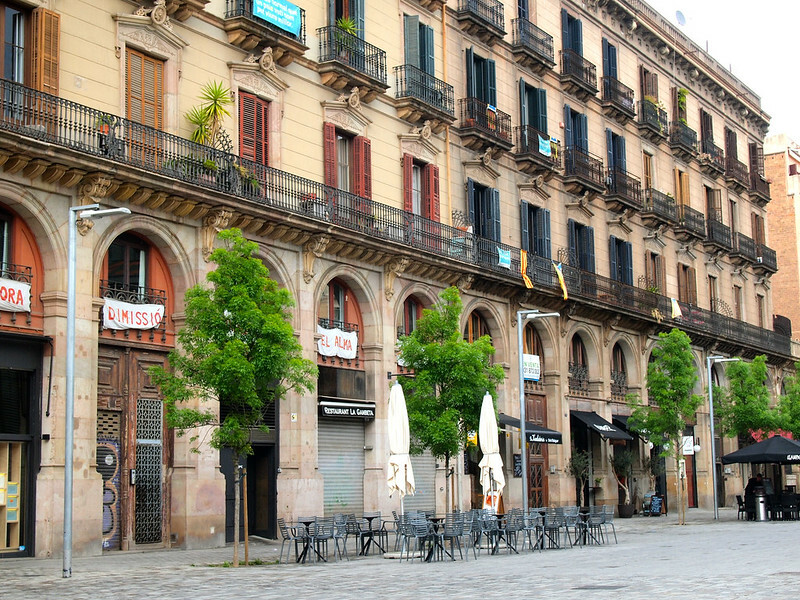 Barcelona is a big city, and it's MUCH more than just Barri Gotic and Passeig de Gracia. I think it's much more enjoyable when you do a little further wandering. Like I said earlier, I ended up LOVING Barcelona. It's a city I will definitely go back to again, and hopefully enjoy just as much a second time around. Everybody that told me it was “meh” and dangerous was wrong. I found it to be a beautiful city — and I didn't feel like it was any more dangerous than any other large city I've been to in Europe. But, of course, you probably shouldn't listen to me, either. 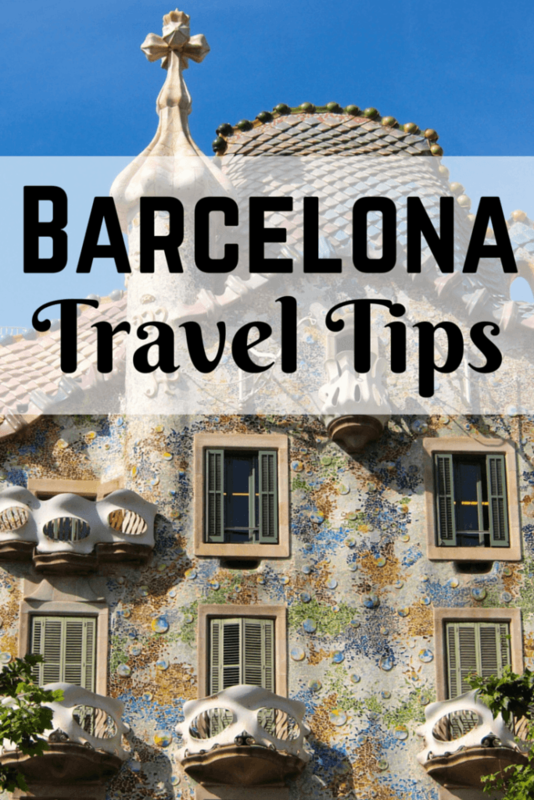 Instead, go to Barcelona and see for yourself! What's YOUR take on Barcelona? Love it? Hate it? Never been? *Note: Thanks to GowithOh for hosting me in Barcelona. 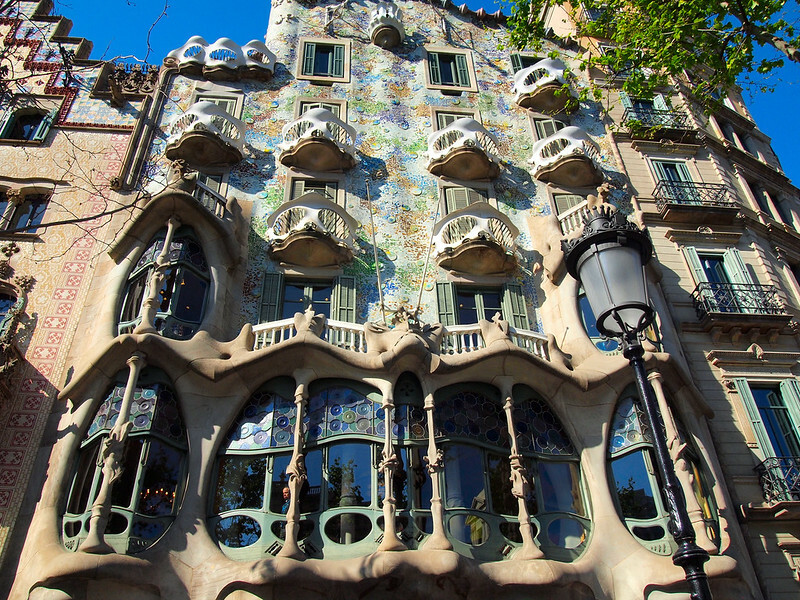 As always, all opinions (and Gaudi obsessions) are my own. I almost had the opposite experience! I visited before I started blogging, and all of my friends and acquaintences seemed to love the city! Sadly, I just found it “okay.” That said, it was the last stop in a super whirlwind trip and I was exhausted, so I should probably give the city another go! Haha, maybe the key is going in April! I’ve been to Barcelona twice now, and because it’s such a large and diverse city, I managed to come away with different experiences and memories each time. It’s definitely one of my favourite European cities 🙂 I must admit, I wasn’t aware you can purchase timed tickets online. What a great idea! It will probably rank up there are one of my favorite cities in Europe now, too – totally not what I was expecting! And yes, the timed tickets are genius! Funny, most people I read all love Barcelona! We went just for one night pre-cruise a couple of years ago with a fairly open mind to it and absolutely loved the little that we saw! Dying to get back there for a proper visit as we only really got to experience La Rambla (and some of the little streets around it) plus the marina area. You’ll definitely have to go back someday, Penny! Thanks for sharing the Barcelona love! I love Barcelona too! Great tips to go in the off-season. We went for Thanksgiving, stayed in an apartment, and felt like we had the city to ourselves. One thing that really surprised me was the food! I didn’t expect to love the food so much! Glad you mentioned El Born, great neighborhood! I didn’t realize either that you could book timed tickets ahead of time. Great advice! I think the off-season really is the way to go! I haven’t been to Barcelona yet, but I’m going to Spain in the fall and I’m debating on whether or not I should go to Barcelona (only there for a week, and I fly in and out of Madrid). This is definitely pushing me toward the go to Barcelona side, personally I’ve always thought the city looked pretty cool. If you think you’ll have time, I would say go for it! Maybe split your time between Barcelona and Madrid. You can take the train between the two – the high-speed AVE should get you there in a couple hours! I haven’t been to Barcelona, but I highly recommend the south of Spain if you’re trying to decide. I love the charming white villages (Ronda and others) in the south and if this is your only trip to Spain, it’s a travesty to miss the Alhambra in Granada (stay in the Moorish section if you do make it there.) There is also a wonderful day trip to beautiful, medieval Toledo, which isn’t far from Madrid. I’ve been to Spain twice. Studied in Salamanca for a summer in college, long ago. Seville is my favorite city in that country (so far.) I do need to visit Barcelona though. 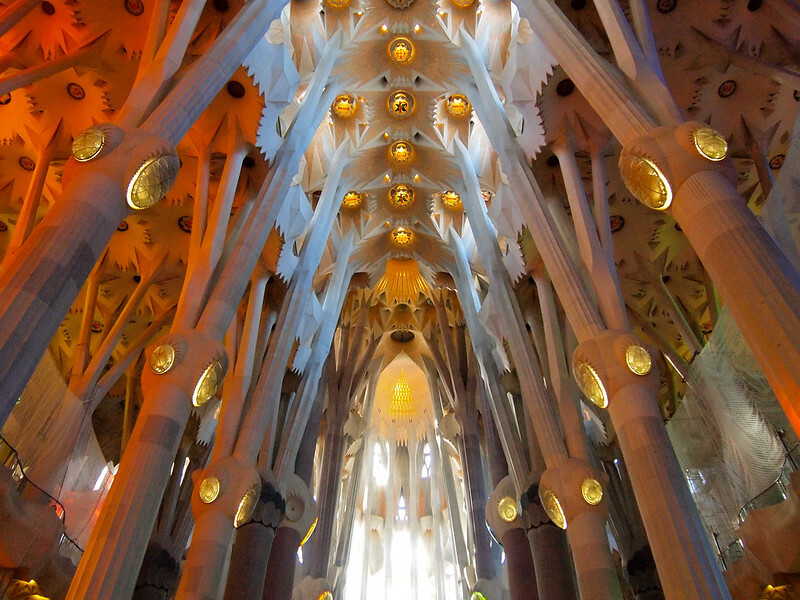 I’d love to see Gaudi’s architecture. I had a friend who was robbed there, but I won’t let that stop me. Have fun wherever you go! Glad to hear you loved it, too! And yes, I agree that I felt like the “danger factor” was on par with like Paris or Rome. Bottom line: be aware and pay attention in ANY big city in Europe. 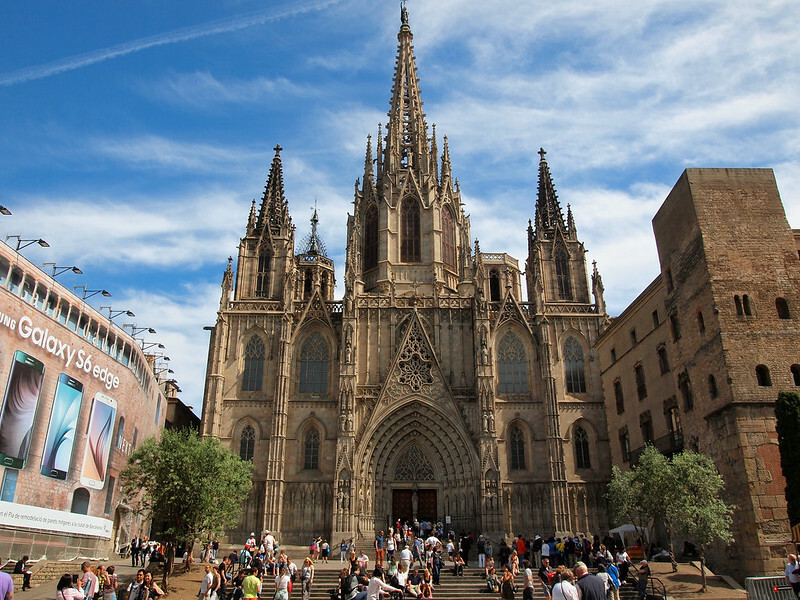 As for going back when the Sagrada Familia is finished… haha, you might be waiting a while! Have been several times and Barca is probably my favorite city in the world, because of the fantastic mix of food, culture, architecture, weather, beaches, etc. Like any great city, there are reasons why there are so many tourists. Because it’s an amazing place! I live in Santa Monica, California and I love to inhabit a place where people from all over the world come to vacation. Yes, touristy places are usually so touristy for a (good) reason! Really good information! I’m heading to Barcelona this fall (November) for work and, while I’m looking forward to visiting for the first time, I’ve also heard not so great things. I guess that’s why I haven’t visited yet despite multiple trips to other parts of Spain. I agree that it will be much nicer during the off season like most of Europe, and look forward to following some of your advice to make the most out of my time there! The off-season will definitely be better – hopefully some of these tips prove useful for you! I’ll be interested to see what you think – Barcelona has a bit of a reputation in Europe, but I think either it’s changed, or that rumor has just been going around for so long that everyone believes it. I was in Barcelona in January, and it was fabulous! I found great ice cream, a sweet Armenian restaurant and cool alleyways that were fun to explore. Glad you had the time to check it out too! Awesome, glad to hear you enjoyed it so much! Yes! I wholeheartedly agree. I LOVE Barcelona. I have been twice and the first time was meh (10 years ago). But, I wanted to give it a second try and I just went back in January 2015 and absolutely fell in love. In fact, I could even see myself living there someday. It’s totally my kind of city! I feel like maybe the city has changed in the past few years. I absolutely loved it, too and will definitely be going back! I keep hearing the same things about Rome & Naples: crowded, touristy, and overrun with pickpockets. I’m headed there anyway in a few weeks. I hope I am as pleasantly surprised as you were in Barcelona (which looks beautiful, btw). I can’t say anything about Naples since I haven’t been there, but I think Rome is one of those must-visit places in Europe, regardless of how touristy parts of it can be. Just be aware of your things and you’ll be fine! I never really thought about Barcelona…it has not managed to fall in my bucket-list, but what I see and read here is amazing! The city looks so colorful and pretty! Love your cute little terrace..I’m sure you had a great time blogging from that lovely corner! And yes, I thought Barcelona was beautiful! I visited Barcelona for the first time in May too. I was there for the second week of the month and had many of the experiences you described above. It truly is a wonderful city and I fell in love with it too! Glad to hear it, Jodie! It’s such a beautiful city. Haha, yes, clearly I am friends with the wrong everybodies! Thanks! I had fun writing it, highlighting all my favorite bits of the city. Plenty more Barcelona content to come, too! I’ve lived in Barcelona for the past 10 months and I still haven’t been robbed or heard of a friend who has been robbed. I’m about to move to my new studio flat in El Born, and you’re right, it’s a great neighbourhood. It’s very lively at night and full of cute shops and good eateries to keep you entertained. I think Barcelona has so much to offer, but it’s a pity that many tourists don’t venture outside of Las Ramblas and Passeig the Gracia. Oooo I’ll bet living in El Born would be lovely! And glad to hear that the experience living there is similar to what I saw! Stunning photography! It has been a few years since I spent sometime in Barcelona. My mom and I had a wonderful time and I would loooove to go back!!! I just got back from Barcelona and it was amazing. I didn’t fall in love with it completely, but I’ve traveled enough to know that it’s probably because we stayed in exactly the wrong location. We rented an apartment and the map of the exact location was not quite accurate on the booking site, which we did not realize until after we arrived. We were offered beer and drugs on the street the minute we stepped out of the taxi from the airport at 9:30 pm. HOWEVER, we only encountered this sort of thing at night going back and forth from our apartment and outside one nightclub we decided to visit. These are both very contained areas we could have avoided had we not been staying in the middle of it! The rest of the city was wonderful. The big sights are so worth it. We spent so much time at the Sagrada Famiglia and only left because we desperately needed to eat something. On our last night we discovered the El Born neighborhood and my friend and I are already planning our return trip to stay in El Born, it’s just gorgeous. We felt perfectly safe everywhere but right outside our front door and even there we were only worried about being pickpocketed. 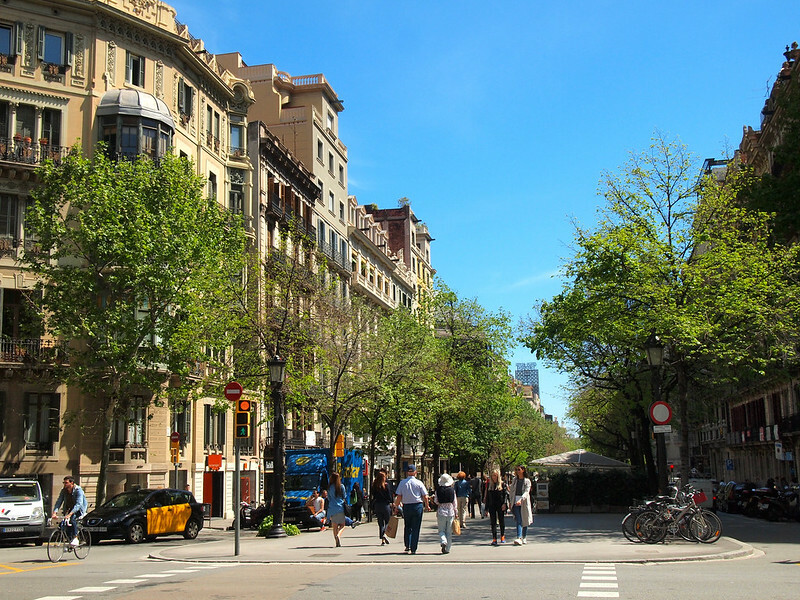 But I’m sure plenty of travelers would have been so put off by our few blocks of an otherwise great neighborhood that they’d have come home despising Barcelona. I’m so happy you liked Barcelona too! Glad to hear you didn’t let one part of one neighborhood completely sour your experience! I did enjoy Barcelona both times I visited and would definitely go back, but I was one of the unfortunate victims of the robbers. It’s hard to be vigilant all of the time, so I would probably just try to leave anything important at home. That’s always a good rule, too. I pretty much only went out with as much cash as I thought I would need for the day. Made me feel a lot better, knowing there wasn’t much in my wallet to steal! So great to hear you went and experienced the place for yourself! I love Barcelona too – although it’s been a long time since I went. Your post has reminded me how beautiful it is: Gaudi, Street art. It definitely is a beautiful city! I got kind of obsessed with seeing all the Gaudi stuff! Also SO surprised to hear of people not liking Barcelona! It is high on our short list of ‘cities we’ve visited that we could see ourselves moving to.’ I often think that whether or not people like a place has more to do with them, and where they are when they visit than the place. There are towns I didn’t much care for, but I am sure that if I had been in a better mood, or had done different things while I was there I would have felt very differently! Yes, so true! Everything from attitude to weather can affect how you experience a place. And, sometimes, one bad experience can completely turn a person off a city. You changed my mind. I was also heard that Barcelona is a a boring place. So i didn’t intend to visit there. But now after reading your article I have decided to go there as soon as possible. keep posting like this. Great to hear! I of course can promise you’ll love it like I did, but you’ll never go if you don’t visit for yourself! That looks amazing! I’m surprised you’d heard so many negative things about Barcelona. I thought it was a must visit destination! Well, it is definitely a must-see after reading your post! Thanks for sharing! Well it will definitely be a city I dub as a “must-visit” from now on! I had some trouble with the airlines because my flight was delayed for over 10 hours and I only live in Germany, but I didn’t let it spoil my Spanish experience LOL! Barcelona is a great city full of Spanish charm, lovely boulevards and the sea. I even liked it better than Madrid and can’t wait to go back again. Aww well I’m sorry we missed each other at TBEX! Glad to hear you love Barcelona too, though. It’s such a cool city! In my experience it is always best to visit a place and decide for yourself if you like it or not, even if everyone says that it is terrible. I’m glad you chose to go and found a city that you liked so much. Yup, that’s been my experience, too, Dean! We all have such different tastes and perspectives that it’s impossible to take someone else’s experience and assume yours will be the same! I LOVED Barcelona too. In fact, I loved it so much I felt compelled to share it with my mother and we explored the city together. We spent most days just strolling and had the time of our lives. 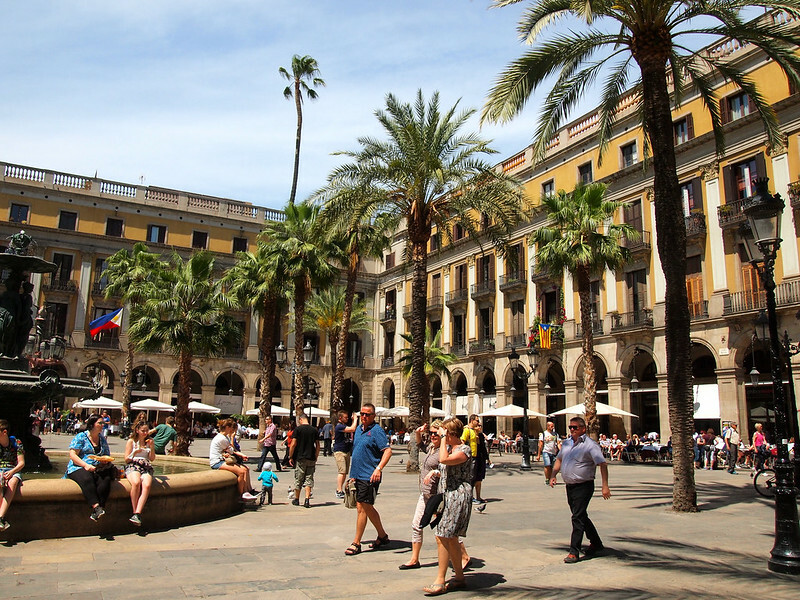 La Rambla is the worst part of the city – worst food, expensive, and dangerous because of the concentration of tourists and therefore tourist crime. We avoided it and discovered architectural, cultural, and culinary gems around every corner. I say it’s a must see. And so many people only focus on La Rambla and the area around there – I’m convinced that’s the reason some people don’t like Barcelona. That was my least favorite part of the city, too! I just stumbled upon this article and agree with what you say. I just got back after 4 days of visiting Barcelona – basically 7 hours ago – and loved the city. It’s so lively and offers so much to do and see. The architecture is great and the little hidden cafés and tapas bars are so lovely. I would definitely go back in an instant. 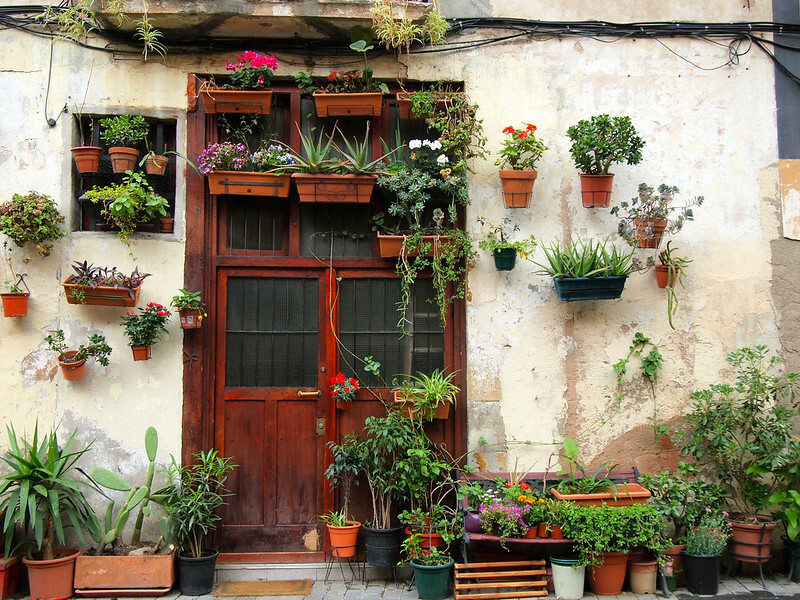 Yup, I’m kinda already dreaming about my next trip to Spain! I really have no clue now why I put off going there for so long… it’s awesome! I lived in Barcelona for 6 months when I was student, absolutely loved it, such a cosmopolitan place and amazing nightlife. I think it’s a lot like London, in that there’s a very well defined tourist trail which you’d probably stick to if you only went for a week, but so many different, unique neighbourhoods to explore if you’ve got a bit more time, one of those places that’s constantly innovating and reinventing itself rather than falling back on past glories. Glad you liked it anyway! I think that’s a great comparison, Tom! Good to hear! I think wandering around in Barcelona definitely is one of the best ways to enjoy it! I am very glad that I found your post because I was unsure if I want to go to Barcelona. People that I know and have been there told me the same things about the tourists and pickpockets. I believe that in every large city is kind of the same and I am really not afraid to go there! 🙂 I love Spain and if I didn’t have my own business in London I would straight move there! Thank you for the post! I mean, sure, you need to be careful, but I don’t think it’s any worse than the touristy spots in, say, Paris or Rome! If you want to go to Barcelona, do it! I love your photography, nice framing in each picture. 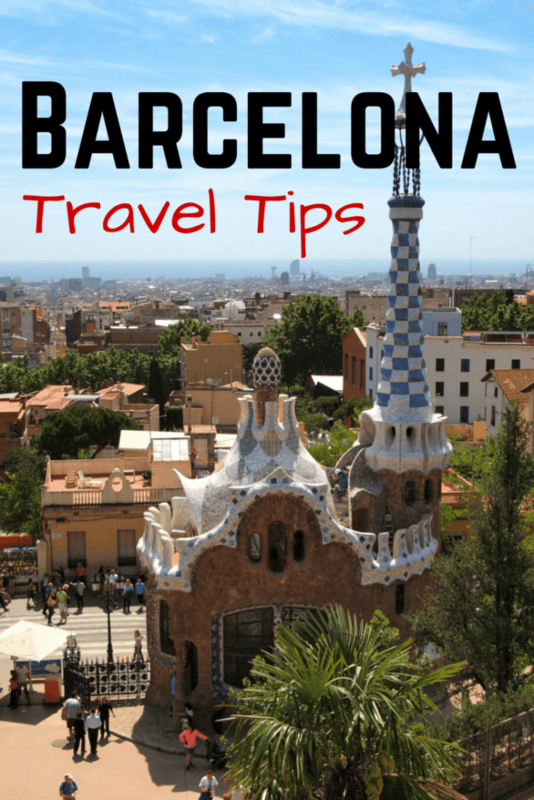 Great information for the people who are going to visit Barcelona first time. Great tips on your blog. Wondering if you can give us infoa nd tips. We will be in BCN on July 7-9 for our Carnival Cruise. We hv 2 days before the sailing, wld you recommend places to go to and restos and the safest place to stay. I fell in love with Barcelona, too! I went end of October for a long weekend (I live in the UK) and I didn’t really have high hopes for it, I just expected it to be a normal city with some nice buildings and like you – I almost didn’t go as I was so worried about pickpockets! I was completely overwhelmed with Barcelona. The moment I landed at El-Prat, I was already in love! So much beauty in one city! I love the markets, the parks (I could literally spend the whole day in Parc de la Cittadella, such a beautiful park) everything about Barcelona was just beyond my expectations and I’m so happy I went! Definitely a new fave city for me! I think the only thing I didn’t like about Barcelona was *thinks hard* Catalans don’t have dinner until late, around 8-9pm so it was difficult to find something to eat before then! Haha OMG, I’m totally with you on the late dinner thing! I’m not used to eating so late, either! Glad to hear you loved Barcelona, too. It’s definitely one of my favorite European capitals now!